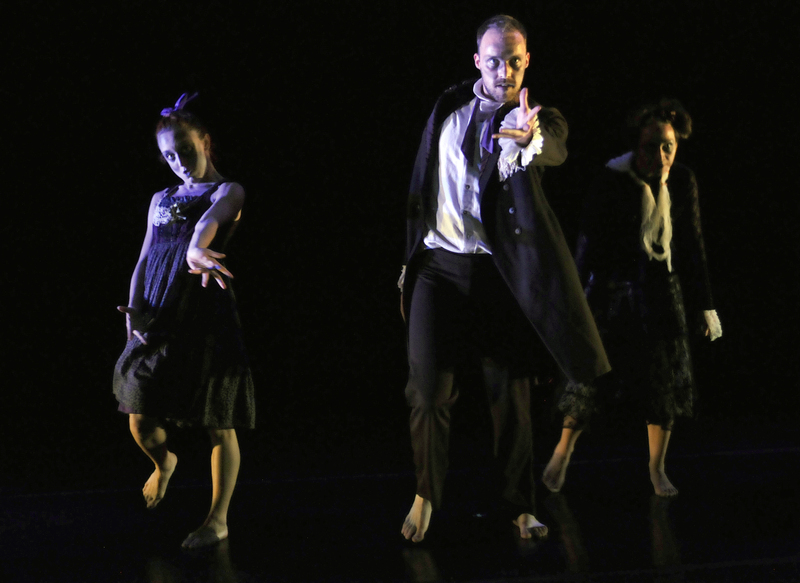 On Sunday afternoon at the Hartt School’s Handel Performing Arts Center, Vivid Tapestry was presented by the Full Force Dance Theatre. It would prove to be an excellent mixture of five previous compositions created by Full Force’s Artistic Director Katie Stevinson-Nollet. While this recap is neither exhaustive nor filled with technical notes, I hope the layman’s perspective is of some use. Also, clearly, words cannot even come close to capturing the true nature of all these dances. To appreciate the dances, one really had to see them performed. The first dance of the afternoon, Danse Macabre, was premiered during a Hartford Symphony Orchestra performance earlier this year, however Stevinson-Nollet noted that the company had to work with a small space at the front of the stage when working with the HSO. I witnessed that performance and know exactly what she meant. In the re-staged version, the four explosive dancers had much more room to work with and they used it well. The performers, Giovanna Carrain, Christopher LaFleche, Tiana Mancuso, Kirsten Schranze once again did an outstanding job as dead souls who rise from the grave to dance again. Danse Macabre‘s music was not surprisingly the well known piece of the same name by Camille Saint-Saens. The costuming and makeup was first rate putting the four into ratty formal outfits, and giving their faces the look of death without interfering with the beauty of their motions and expressions. The action began with the four lying down “dead” on the stage. Slowly in a stilted manner they rose though eventually this zombified dance would give way to more fluid movement. The dancers would shift back and forth between the attempts at elegance inhibited by death, and successfully smooth elements. They also took on the form of creatures, often hunched over and rolling along on the ground, only to soon be dancing in regal pairs moments later. LaFleche and Carrain often were dance partners while Mancuso switched in at times. Schranze was often on her own blasting hurriedly across the stage on her own course before returning to the others. When “the sun” rose in the distance the four looked at it worriedly only to back away to continue their movements. Soon they would would once again be drawn to the approaching light, piling on top of each other with Schranze clambering atop their hastily formed pyramid in a stirring moment. As their time was running out, their urgency increased as they swept across the stage furiously. This final portion included a nice sequence of split leaps in unison. The frenzy would diminish soon and they would return to their graves placidly ending where they began. After the opener came Daughter of the Sea which was one part poetry reading, one part concert, and one part dance. 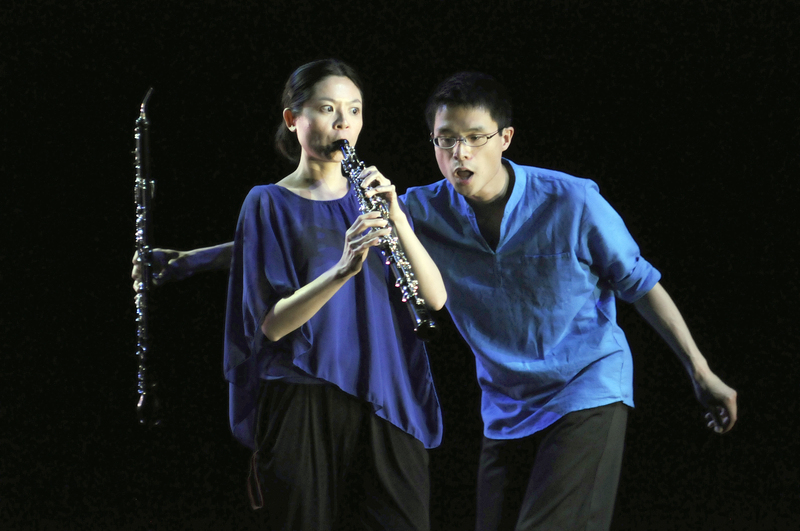 Oboe Duo Agosto, a group of two musicians, took part. Ling-Fei Kang who played Oboe, and Charles Huang on English Horn, opened by reading excerpts from sonnets by Pablo Neruda. These words were the prelude to six musical movements, which blended playing, spoken word, and movement for the pair who are not trained dancers. In her opening remarks Stevinson-Nollet called the pair “very brave” to take on the multitasking necessary to pull the performance off, but they excelled. The accompanying music was composed by Andrea Clearfield, an excerpt of which can be found here. The six movements were all different in nature, some serious and sad, while some were whimsical. Each involved different types of motion, whether it was posing and leaning for effect, or gradual careful walking and positioning on stage. Kang at one point rolled and Huang even did a balance while he played a note during the humorous portion of a segment. The various scenarios sometimes paired the two musically and sometimes put them in opposition to great effect. The music itself differed between being upbeat and sad, as well as melodic or shrill depending on the emotion involved. The strongest memory taken from it was the whimsical movement when in an exchange Kang would remark Huang was ugly, and he would launch into a silly theme. He would then call Kang beautiful and she would play a beautiful melodic piece in return. This all occurred while the pair moved adroitly. The overall performance ended with Huang actually walking to the exit door while continuing to play, as Kang remained in a spotlight in the center of the stage. The pair executed this unique composition very well. Next came Flit, a name suggesting speed, however, the display began with a lone dancer, Carrain, with her back to the audience. She was struggling, as if she was trying to get her limbs to loosen and pull from her body. Slowly she succeeded, eventually loosening and moving slowly and gracefully. She soon exited, and Kristen Balsamo, Katie Bittner, Marjorie Gross, and Brianne Taylor appear on stage all clad in flowing blueish-green dresses moving quickly as drums kick in and music picks up. This launches a fast flowing dance all over the stage as the dancers move swiftly darting from element to element often leaping as they skim around the space. It was hard to keep up with but a spectacle nonetheless. They flowed between dancing in unison and doing their own different parts well. After so much energy was displayed, Carrain ended the piece by moving backwards quickly into darkness. Bill Solomon composed the music for the vibrant sequence. All five dancers were splendid in making such a complex fast paced design look so gorgeous. After the airy flight of Flit, this dance was far more dramatic and heavier featuring Gross and Schranze. It opens with both women facing away from the audience. Schranze slowly moves to Gross and attempts to touch her, only to be rebuffed repeatedly. The two spend much of the dance in opposition, often moving in unison but seemingly at cross purposes, either holding each other back or running away only to be caught by the other. The tension is clearly conveyed and executed through their expressions and actions, as the two interact in a painful scenario. Finally a sitting Schranze is lit and Gross stands in the darkness as seconds later the stage is enveloped in black. Composer Ben Frost was behind the mood setting music. It was interesting to see Gross and Schranze who each had burst through more upbeat dances turn that energy expertly into a piece filled with angst. The last dance of the day was incredibly active and whimsical as LaFleche, Balsamo and Taylor found themselves in an apparent love triangle, literally in the choreography, as well as figuratively. They danced splendidly, they danced hard and they danced everywhere. LaFleche often was in the center of the two women who were attempting to earn his attention with great persistence. When one of the women succeeded and paired with their male target for a duet, the other danced off smoothly to wait for their next opportunity, which they would soon get. LaFleche’s role had a conflicting dynamic in that he was clearly not sure of which woman to pair with, but he was nonetheless dancing with full confidence. The character’s body was fully committed even if his mind and heart was not. The two women differed in their approach, each determined, but one tempting him with an alluring smile, while the other remained intensely serious. The dancers were clad in red tinted clothes, not surprisingly given the romantic tone. The dance rivaled Flit in terms of pure speed of action and constant motion though with clearly different meanings. The piece of the same name composed by Luigi Boccherini accompanied the trio. The sounds were slow and regal at first but guitar and castanets quickly brought on a speedier and lighter feel. The well timed elements and plenty of powerful turns were one of the many highlights of this dance that was far too fast moving to keep entire track of. It was a firecracker. The performances were seemingly over so quickly, and the bows were taken. Mary Sheldon and Gail Fresia had done excellent work with the costumes. Sheldon previously put together the fine Hartt Dances costumes as well. As a note, Emory Campbell assisted with choreography on With my Last Breath as well. Stevinson-Nollet had noted that for every dance created, it would require, on average, four months of rehearsal for the result of just a few performances. Vivid Tapestry gave the opportunity for some of these dances to get another viewing, and also allowed for re-staging choices to be made as needed as they were for Danse Macabre. It was unfortunately the last performance of the Full Force Dance Theatre, but the collective efforts of all involved created an excellent though bittersweet finale. A blog in Connecticut is a blog where the title is relatively meaningless, but where you can find commentary and features about Connecticut and beyond. Comments do not represent the views of my employers or any media organization I contributed to in the past.